The screenshot above is hosted and provided by binarynow.com. Please contact them directly for any copyright infringement as we are not responsible for that content. SoftMaker Office 2018 offers an affordable, lighting-fast and easy to use alternative to Microsoft Office. It uses the Microsoft formats DOCX, XLSX and PPTX as its default file formats to skip the annoying import and export. Includes TextMaker, PlanMaker, Presentations, BasicMaker and integration with Thunderbird email client. This integrated solution for creating, editing and viewing documents, spreadsheets and presentations uses the same document format as Microsoft Office. Even the latest Microsoft Office (2007-2016). Export documents, spreadsheets and presentations into Adobe PDF (Portable Document Format) directly for quick and easy online distribution.PDF bookmarks, table of contents (TOC) and permissions are supported. New modern ribbon user interface can access all functions SoftMaker Office offers and make it easy to use. Users can switch at any time between modern ribbons and the classic user interface with menus. Personalize your mailings by merging data fields into a document when you print labels, envelopes or letters. Merge to printer, e-mail, fax or file. Comprehensive database module for dBASE files allows easy maintenance of addresses and other information for mail merge. PlanMaker has an extensive functions library with more than 360 built-in function to perform date and time, mathematical, statistical and financial calculations and to do data analysis. Presentations enables users to create high impact, dynamic presentation and export it into movie (video format .AVI or .WMV) or into .HTML or .PDF. 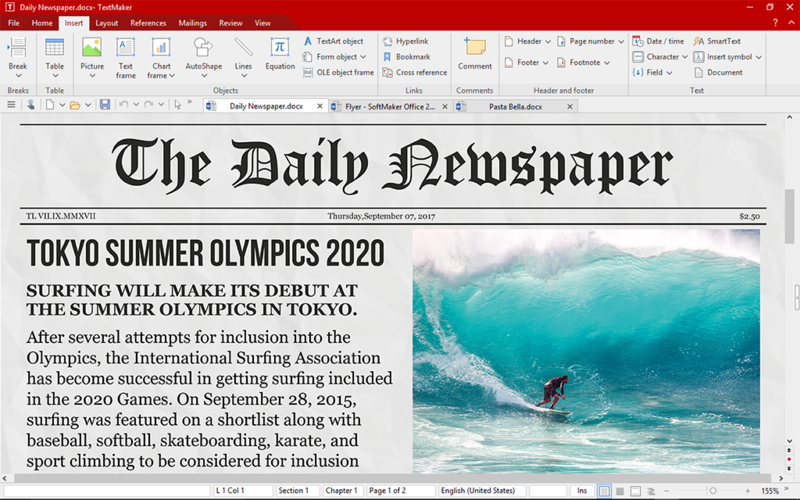 SoftMaker Office 2018 is available in two editions: Standard and Professional. Home users can use a Standard edition on up to five (5) computers in their household for mere $59.95 one-time fee. Any organization can save on deployment costs and use SoftMaker Office Professional. Pricing for Professional Edition starts at $79.95 per user, and volume discounts are available with an affordable corporate licensing.